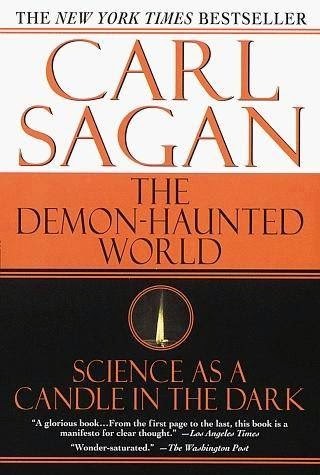 I chose to read the book "The Demon Haunted World- Science as a Candle in the Dark" By Carl Sagan. The reason I chose to read this particular book was first because I have a very strong interest in the story, science, and religion of demons. Secondly, I have read a few of Carl Sagan's books and other publications, and I find him to be an extremely talented and intelligent man on many different levels. I was so very excited to see one of his books on our reading list!! Before I explain why I loved this book so much, I'd like to give a little background about Carl Sagan. Sagan is a professor of astronomy and space sciences at Cornell University. He has been awarded medals and other prestigious awards from NASA. Carl Sagan is a very important person in the community of Planetary and Space Sciences. The formatting of this book is quite refreshing compared to other novels that you will read- it breaks the mold of that textbook style non-fiction book writing style. This book is an assemblage of Carl's and Ann's essays (Ann is Carl's wife), and instead of them all being about one thing, they cover a wide array of different topics: aliens, demons, magic, satanic religions, unidentified flying objects, and even astrology (one of the most famous pseudosciences). My favorite essay that Sagan shared in the book was "The Most Precious Thing". I learned a lot about him, from reading about his beliefs and his experiences, because the truth is (for me at least) his opinion in the world of pseudoscience and the paranormal is taken with very high regard. Aside from the fact that this book is a collection of essays, the way Carl Sagan writes about the paranormal is in such a passionate way and in such an organized fashion that you almost get the feeling that you are reading some sort of scientific poetry. The beginning of "The Most Precious Thing" essay starts with the thoughts of Sagan getting off of a plane and seeing someone waiting for him with a name sign. He then begins to tell a quick story about how the man with the sign did not realize that Carl Sagan was the famous scientist guy, and you can even feel in Sagan's response that he is a little ticked. I found this to be very entertaining, and a great way to start off the book and get a bit of insight into Sagan's personality (for those who don't know it). "Science arouses a soaring sense of wonder. But so does pseudoscience. Sparse and poor popularizations of science abandon ecological niches that pseudoscience promptly fills. If it were widely understood that claims to knowledge require adequate evidence before they can be accepted, there would be no room for pseudoscience. But a kind of Gresham's Law prevails in popular culture by which bad science drives out good." I would recommend this book to anyone, not just people who are interested in the sciences or the paranormal. There are many quotes that Carl Sagan writes that make a lot of sense and that are applicable to someone's everyday life (if you switch a few words around).